is well-known amongst sophisticated international travelers as one of the best secret tropical hideaways; a sanctuary for couples and honeymooners. It marries utmost privacy with comfort and bliss. The resort consists of 25 luxuriously appointed private pool villas, situated in “The Valley of the Kings”, just minutes from Ubud. A romantic package in a 150 sq.m terrace pool villa (minimum of two nights) starts from a bit over Rp.15.000 000 per night. The package includes accommodation, daily breakfast, a flower bath, a 6-course candlelit dinner, a 2-hours couples spa treatment, return airport transfers, free non-alcoholic drinks from the mini bar, free use of jacuzzi and steam bath at their spa and free shuttle service to downtown Ubud. is situated in the northwest at Bali National Park. The nature and blissful atmosphere of the area offers the perfect romantic retreat and an unforgettable honeymoon experience. You can spend your days by the pool or playing in the ocean, take walks hand-in-hand through the forest searching for Jalak Bali (the Bali starling – a symbol of eternal love) and enjoy romantic candlelit dinners under the stars. 3 nights honeymoon package starts from Rp.9.000 000 plus taxes, and includes accommodation in Monsoon deluxe room (which can be upgraded to either Monsoon suite at extra Rp.600 000 per night or to beachfront villa at extra Rp.1.450 000 per night), daily breakfast, a 90 min balinese massage for two, a candlelit dinner, snorkeling trip etc. in the Sidemen valley east of Bali offers responsible and eco-friendly accommodation to the environmentally-conscious couples. Their wish is to preserve the environment by using no air-conditioning (which is not even needed as the climate is cooler at this altitude) and they have no TVs. They also encourage saving water and energy. 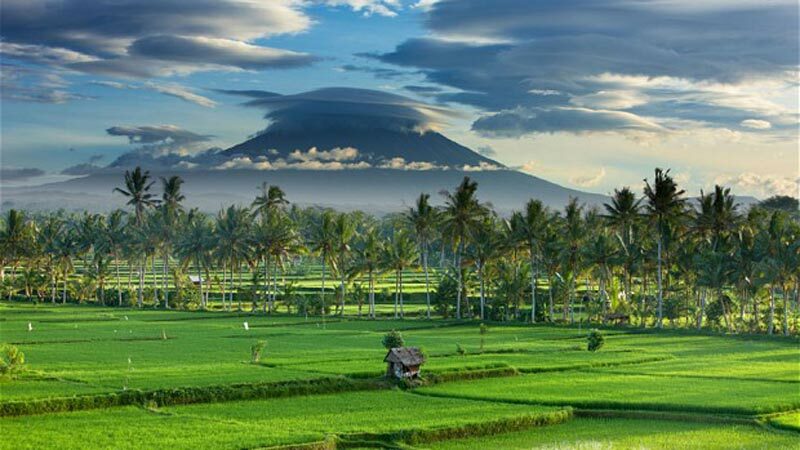 The hotel is built within rice terraces on the slopes of Mount Agung, which is Bali’s highest point and an active volcano. It overlooks the valley with breathtaking views. 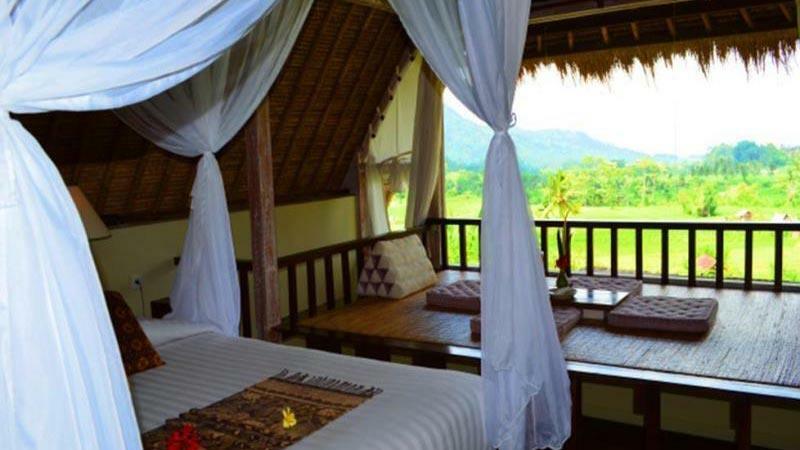 The price for accommodation at Saraswati wooden house (a perfect private spot on the lower level by the river facing rice fields, with an amazing open-air bathroom) with breakfast starts from Rp.1.620 000 per night plus taxes. You can enquire the cost for adding the honeymoon package which includes a 1-hour balinese massage for two, a warm flower bath and a romantic menu prepared especially for you two. 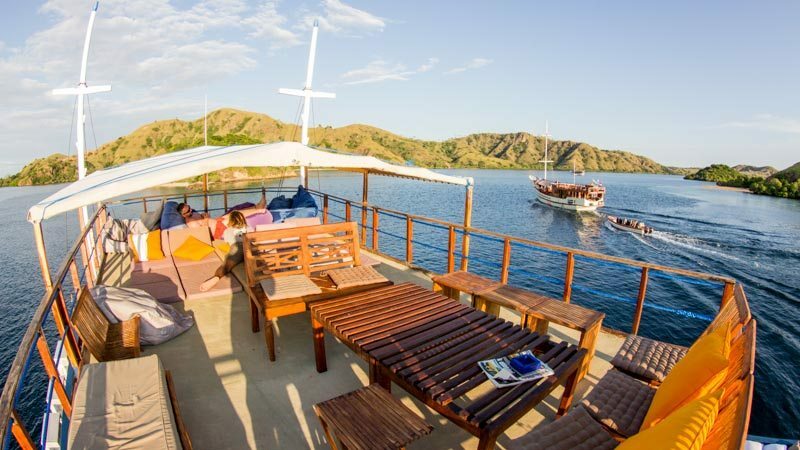 For the couple who loves the sea, Pirates Bay offers a package that combines a few days of blissful privacy at a villa in Seminyak, Bali with a cruise around Komodo, Flores. You will be picked up from the airport in Bali and taken to your romantic, private villa in Seminyak for 2 or 3 nights. 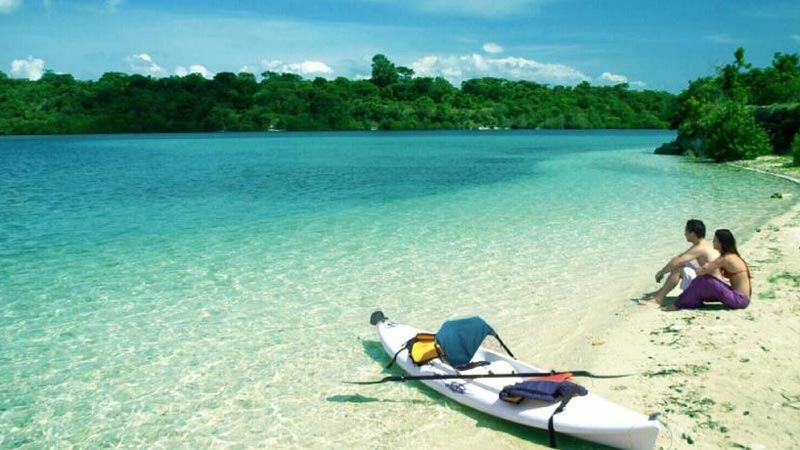 Then you’ll fly to Labuan Bajo, Flores and board your sailing boat for the next 5-7 nights to embark on either a snorkeling or diving adventure, whichever more suits your experience and desires. The prices start from Rp.5.535 000 per person for the Bali accommodation and Denpasar-Labuan Bajo return flights plus Rp.6.500 000 per couple per day for the cruise including accommodation, food, equipment and natural park fees. 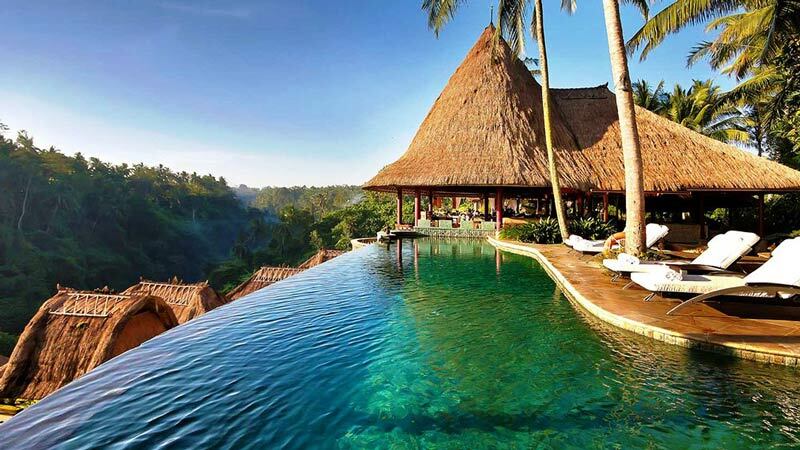 For the couple who wants to get the full honeymoon in Bali -experience, there are many online travel agencies offering similar around the island -honeymoon packages. The itinerary usually goes as follows: Trekking rice terraces in Ubud, watching a traditional Kecak or Barong dance performance, a trip to the gorgeous Mount and Lake Batur in Kintamani, diving or snorkeling in the small fishing village of Amed, visiting temples like the Mother Temple Besakih or Uluwatu Temple, relaxing on the beaches such as the beautiful Pasir Putih, feasting on a seafood dinner at Jimbaran bay and doing some shopping in trendy Seminyak. So if you want to spend your honeymoon seeing a lot of places and immersing yourself in the culture, contact for example Trails of Indochina. Bali has become the number one destination for pre-wedding and honeymoon photography in the world, mostly because of the beauty of the island and the stunning locations. Why not immortalize the memories of your honeymoon in Bali with the help of a team of professional photographers and hair&make up artists. Ideally you should book a full-day shoot but if you are on a budget a half-day shoot is enough to get good results. Make sure your photographer gives you a clear idea of how much time will be spent for the actual photo shooting and how much on traveling between locations. Also remember to ask for other locations than the crowded touristy spots like Tanah Lot, Uluwatu and Jimbaran. Bali Wedding Photography is highly recommended and their services start from the very affordable Rp. 3.800 000. They have over 7 years’ experience, a collection of fabulous wedding dresses and gowns and they work with Bali’s best hair&make up agency. Other photographers with a good reputation are Aditi Niranjan and Dominik. 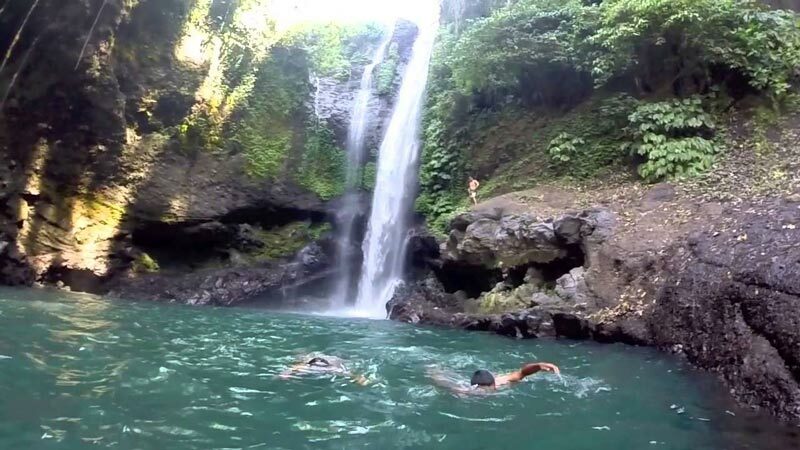 Jembong waterfall in Ambengan village north of Bali is locally known as the best waterfall in Bali. It is located in the midst of cacao plantations and tropical trees. Because of its gentle slope and regular water flow it is an ideal place for spiritual healing. Sekumpul waterfalls in Singaraja are the choice for adventurous types. You have to take a dirt road, survive many slippery steps and cross a river to get there, but the views from the top of these seven different height waterfalls is amazing. One of the most powerful and deeply spiritual experiences you can have during your honeymoon in Bali is visiting a balinese healer (a balian or pemangku as they are called here). Many of these healers mostly work to be able to help their local community and don’t want to advertise their services to travelers, but you can ask around to find one. If you are lucky enough to get an appointment with one, this is how your sessions will likely go: First there will be an initial meeting in which the healer will engage in a range of techniques to ascertain your wellbeing, imbalances and possible past lives. He will study your name, palm and aura. Afterwards he will share his findings and offer you a cure or direction. One possible initial prescription might be Melukat, a spiritual cleansing ritual. It’s purpose is to purify the human body and soul and to wash away turmoil and sickness acquired from negative karma. If needed, the healer will invite you back for an evening Melukat on an auspicious day determined by the balinese calendar, such as full moon. For a less extreme version of balinese healing you can visit Pak Ketut Jaya who works at a compound on Jalan Goutama Selatan in Ubud. He offers for example a Boreh treatment, during which the skin is massaged with a blend of 50 herbs and a balinese sauna, made with steam infused from 80 ingredients. Or you can take part in chakra cleansing at Fivelements-Puri Ahimsa on the banks of Ayung river in the village of Mambal. L’Atelier Parfums&Creations, located at Ayana Resort in Jimbaran or at The Ritz Carlton in Nusa Dua, offers perfume-making classes. You will learn how to make your own perfume and create a unique personalized fragrance that truly reflects your personality, using the finest essences available in Indonesia. You will go home with a 30ml bottle of your creation and if you wish, you can later re-order it and have it shipped to you. The price for 1,5 hours’ class is Rp.1.000 000, but in case you want to learn more about the theory and also get a diploma, you can choose the 3 hours’ class for Rp.1.600 000. 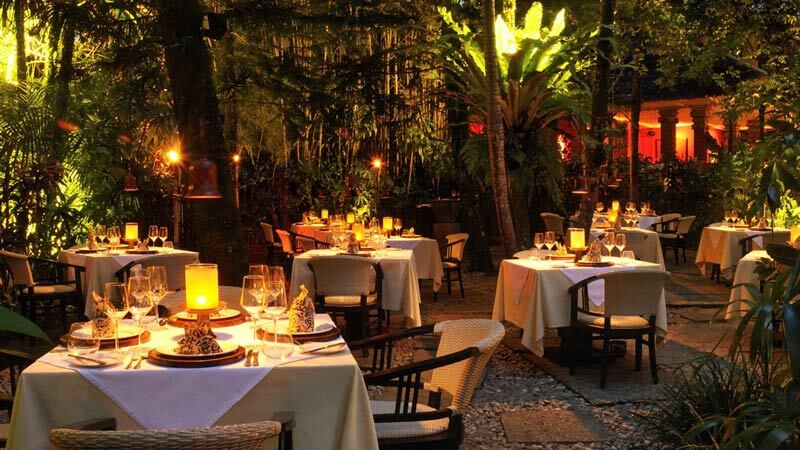 At Mozaic Restaurant in Ubud you get the chance to sample the delicious tasting menus of chef Chris Salans. The 6-course Surprise Menu comprises of dishes that masterfully combine the most precious and finest seasonal ingredients of the world. The staff will acknowledge all possibles allergies and foods you’re not partial to, to make your meal as pleasant as possible. The waiter will explain each dish ingredient by ingredient and the in-house sommelier can guide you in pairing each course with the right wine. The Surprise Menu is priced at Rp.1.250 000 per person plus taxes, wines will cost a little extra. The restaurant is really popular so it’s recommended to book a table at least a week in advance. Prana Spa offers the perfect indulgence for couples in their private spa suite. 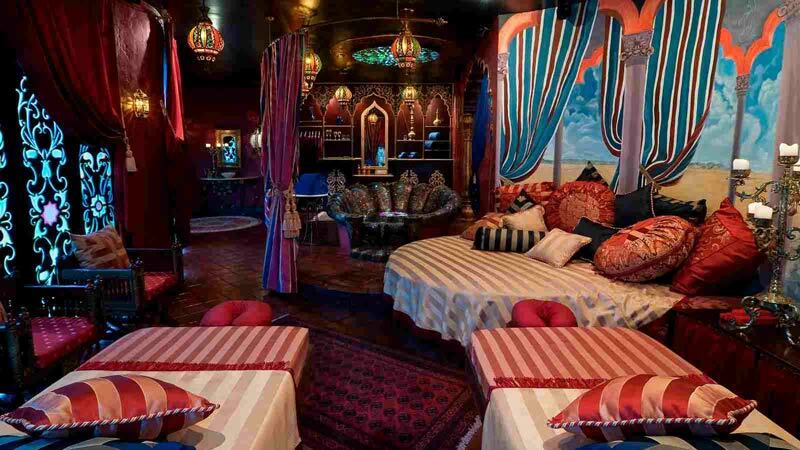 The One Thousand and One Nights 300 minutes’ spa sessions consists of a foot massage and a royal foot cleanse followed by a tailored massage (Queen Scheherazade for the lady to bring harmonious balance of body and soul and the muscle-relieving King Shahryar for the man), facial and crown therapy to nourish the scalp. The session will finish with a private Kama Sutra or Relaxation Yoga class and a romantic bath. One bottle of your choice of wine and selected canapes will also be included in the price of Rp.5.000 000 per couple plus taxes.